Kids know that animals are smarter than grownups think - this Minute will give them the proof they need! The words we use are a critical part of our communication, but humans communicate through body language too. Learning how animals communicate may help our students think about how they children communicate with one another. Read (and share) this article with students as appropriate, and have them chart the similarities and differences between animal and human communication. How can we improve our communication skills with one another? Does learning how communication progresses in children help us to become better communicators? You bet it does! How do you design an effective experiment using animals? Author Patent tells us that researchers in the 1970s were using apes and dolphins to explore animal’s ability to problem solve. Ask your students why these animals might be good choices? What other animals might be good choices? Why? What kind of experiments can your students think of that might demonstrate and animal’s ability to “solve” a problem? What kind of time frames might be needed? This Minute may just inspire one of your students to try an experiment on their own. Check out this list of fun animal projects to try for a science fair entry or just for fun! Have your students check out TED Talks as a great learning resource. 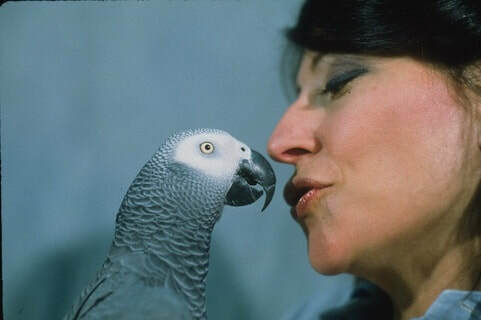 There are two talks related to this story to get them started: Talking With Animals - 7 Examples of Interspecies Communication, and The Interspecies Internet - An Idea in Progress. Have your students explore the “About” tab on the TED site so they can understand how TED gathers its information and curates its materials for viewers.